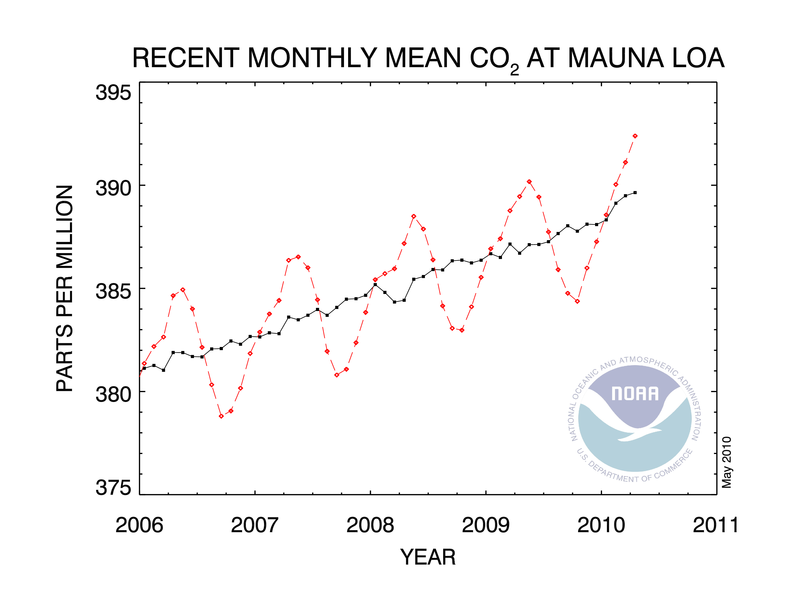 The level of carbon dioxide (CO2) in the atmosphere, as measured at Mauna Loa, has just ticked over to 390 ppm. Actually, that’s not quite true — the level is 392.39 ppm as of April. But CO2 levels are slightly higher during the northern spring than the southern spring, because the Northern Hemisphere has more land and hence more vegetation breathing out CO2. Once you adjust for this seasonal cycle, then the current CO2 level is 389.64 ppm — which rounds to 390. I first got interested in global warming about four years ago when I read TIME magazine’s special issue on global warming. At that time, the CO2 level (again, seasonally adjusted) was around 382 ppm. It reached 383 ppm by December 2006, 384 ppm by April 2007, 385 ppm by November 2007, 386 ppm by June 2008, 387 ppm by January 2009, 388 ppm by August, 389 ppm this February, and now 390 ppm. All these numbers come from measurements made at Mauna Loa observatory, but wherever you look you’ll get similar results. As you might have guessed, it’s somewhat arbitrary to pick a precise month where the CO2 level “ticks over”. But it is important the public understands that CO2 continues to accumulate in the atmosphere, at a rate of about 1.9 ppm each year. The rise is gradual compared to a human lifetime, so it’s easy not to notice it happening. It’s not something that gets a lot of press coverage, because there is really no key moment you can pinpoint where a significant event occurred. But the upward trend is significant. It may seem slow to humans, yet it’s anything but slow as far as the planet is concerned. In the 800,000 years before the Industrial Revolution, CO2 varied from 172 to 299 ppm as the Earth went through regular climate cycles. But even the rapid increases when coming out of glacial periods occurred over millennia rather than on human timescales. Only 52 years ago, when Charles David Keeling began measuring atmospheric CO2 at Mauna Loa, it was 315 ppm; and ice cores tell us that back in 1750 it was just 277 ppm. That’s a rise of 113 ppm in just 260 years. Of course, like all scientific measurements, ice core records have uncertainties attached to them. But other reconstructions based on other types of proxies, though less detailed than the ice core record, show similar variations in atmospheric CO2. 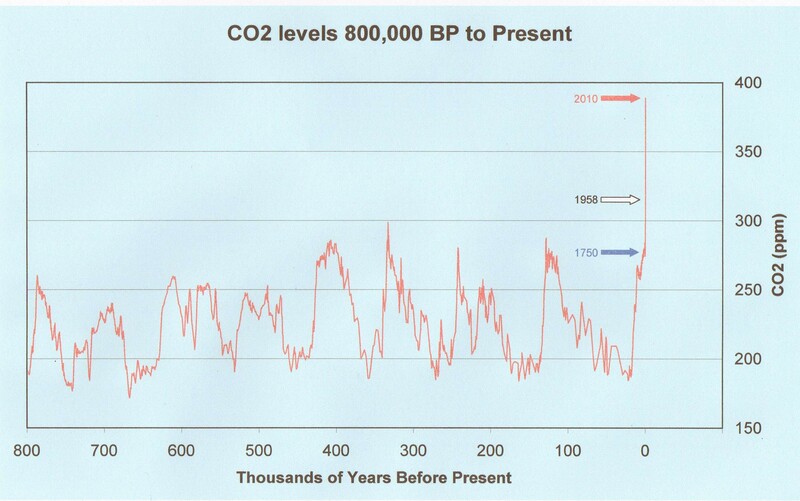 For instance, a 2.1-million-year reconstruction based on plankton shells (the full paper can be read here) shows the current CO2 level is much higher than anything seen during that time. We know all this CO2 must be coming from fossil fuel combustion. Humanity continues to emit more and more each year; global emissions in 2008 were 41% greater than in 1990. And we can’t rely on natural “carbon sinks” to save us. Currently the oceans and land vegetation are absorbing about 55% of our emissions, but the vegetation may even begin emitting CO2 within a century, accelerating the buildup of the gas in the atmosphere. It will take centuries for the oceans to remove most of our CO2 emissions from the atmosphere, and millennia for weathering to remove the rest. And the amount of CO2 in the atmosphere continues to rise steadily, year by year. Does this mean that the climate will begin to respond to a ppm of 392 today-or in the future? Yes, it will begin responding today because the gas is already in the atmosphere and trapping heat. However, because of the inertia of the climate system and the resulting positive feedbacks, it will be decades before we see the full response to current conditions. And once you take into account “slow feedbacks” such as the heating of the deep oceans and the melting of ice sheets, it will be centuries before we see the full extent of the warming and its impacts.